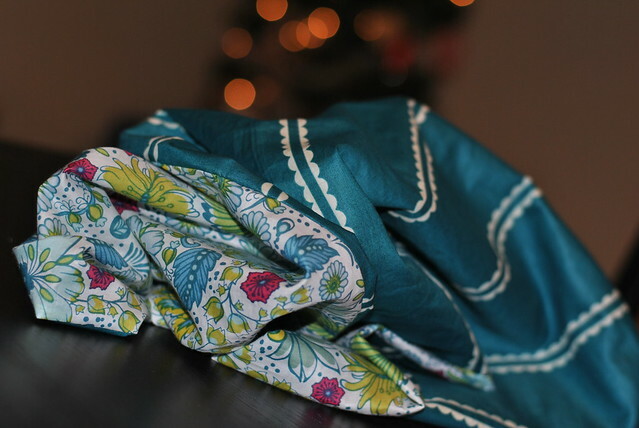 Tonight I sewed with some Anna Maria Horner voile, picked up on sale from the lovely Modern Fabric Studio. And Rafflecopter chose a winner for earrings and Echo fabric scraps giveaway . . .
#683 Erin, who said: "I cant seem to get rafflecopter up. I would love to win this. The Lotta fabric is great. Thanks, Erin"
About 20 of you were having trouble with the Rafflecopter form, so I entered entries as I received them. Congrats Erin! You'll get some earrings and some lovely Lotta fabric for your troubles! If you didn't get your fill of entering giveaways, there are some great ones still going on at the Craft Buds giveaway roundup. Have a great weekend! Hey! Mentioned your scarf in my newest post!